The scarf jointed headstock is an important feature of Granata Guitars. It is much stronger than a one piece with all the short grain in the spot where you need all the strength. Clockwise from above: The scarf joint is cut then trued with the router. The head piece is flipped and then glued back on the neck. Below: The groove is routed into the neck for the truss rod. Above: The dovetail is fit and the neck angle is set. 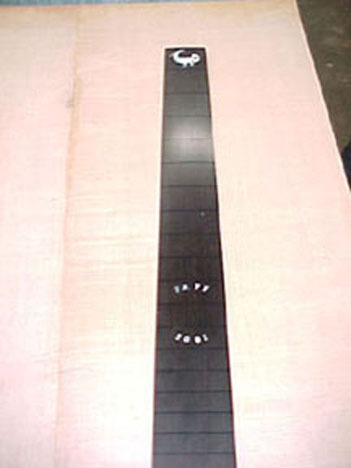 Above: The fingerboard has been radiused, tapered, and the inlays completed. Below: The fingerboard is glued to the neck. 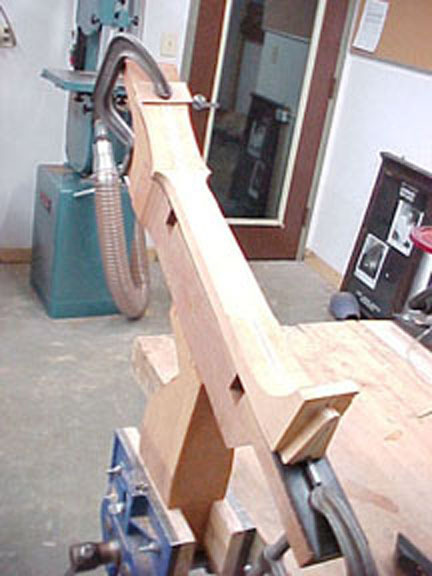 Below: The neck is set in the carving jig to be shaped.